This post begins with a lie… the recipe I’m sharing with you is for Schiacciata Con L’Uva – but the bread that I made isn’t “Con L’Uva” (with grapes) at all! It’s kind of the beauty of it though – even though this recipe is for a traditional Italian flat bread with grapes, it’s so versatile you can really top it with anything. 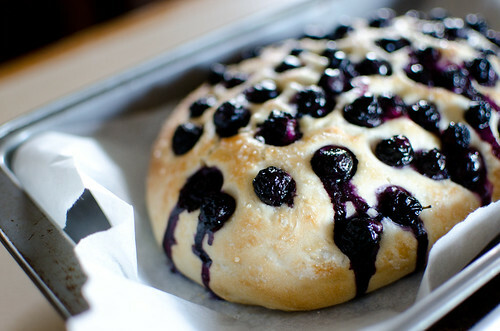 The photo above is a Schiacciata I made with blueberries – which just happen to be in season and so super cheap right now – but honestly you could use almost anything. I first learnt how to make this bread last year at Brassierie Bread’s Artisan Bread Masterclass at Masterchef Live (see my post about it here) – it’s so simple and now I make it all the time! Home-made bread takes a little bit of time to make – the kneading, and proving… but the results are so worth it! 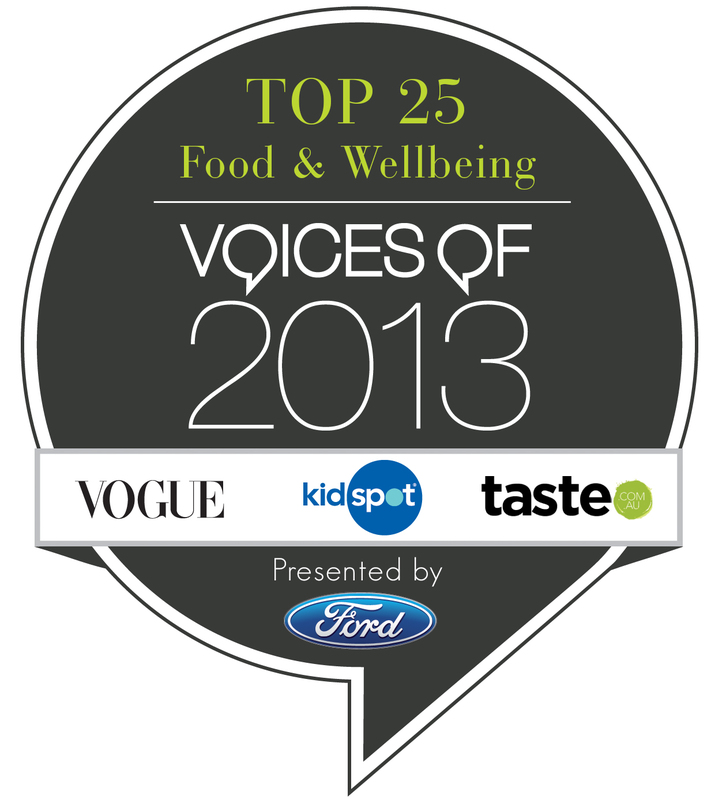 I’m definitely no expert, and if even a super kitchen noob like me can do it, I reckon anyone can!! Of course reading a blog post is nothing compared to being taught the actual process live – and if you are able to, I would strongly recommend booking in a baking class at Brasserie Bread. You will not regret it! Their teachers are so patient and excellent and really give you the confidence to make bread at home! Some recipes call for you to mix your yeast with warm water to “activate” it and to speed up the process. This is totally unnecessary. Adding warmth to the process speeds it up, but this comes at the cost of flavour. This recipe from Brasserie Bread instead calls for chilled water, and if possible – to keep your dough in the fridge as it rises. The cold slows down the process and allows the complex flavours to develop. Don’t be alarmed if your dough is really wet and sticky! Your first instinct will be to flour your table or board and to keep adding flour to make your dough drier. Resist the temptation! The wetter the dough is, the better. 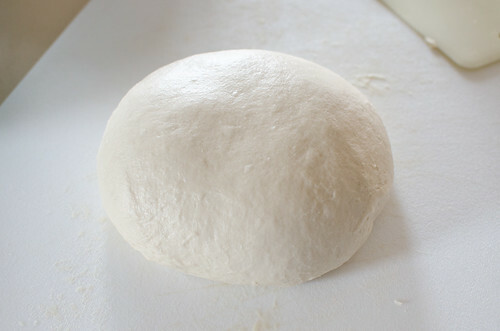 The dough will become less and less sticky as you begin to knead, until it eventually becomes nice and smooth. 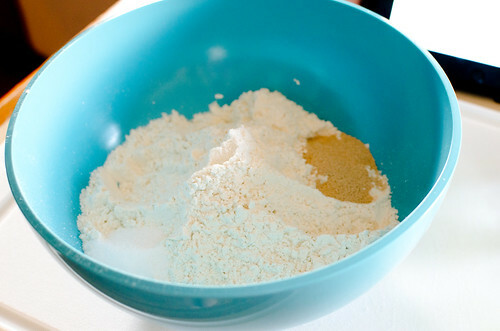 Adding extra flour by flouring your board will only make your bread tougher! Bread calls for flour with a high protein content. Brasserie Bread uses beautiful unbleached organic Kialla flour, which they also sell in their cafe shop in Banksmeadow. The Kialla flour has a protein level of 12.5% – which means it’ll be able to form the strong gluten bonds that are necessary to make bread. 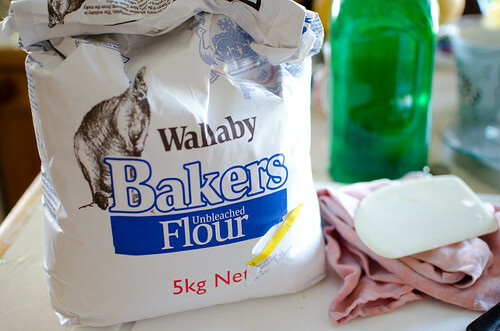 Ordinary plain flour has a protein level of around 10% and if you use it, your bread will probably rise too much and then fall flat, as the gluten bonds aren’t strong enough to hold in the air. Yeast on one side, Salt on the other side – if the salt comes into direct contact with the yeast, it will kill the yeast! The kneading uses a French method popularised by Richard Bertinet… here’s a youtube video I found which demonstrates the throwing method! 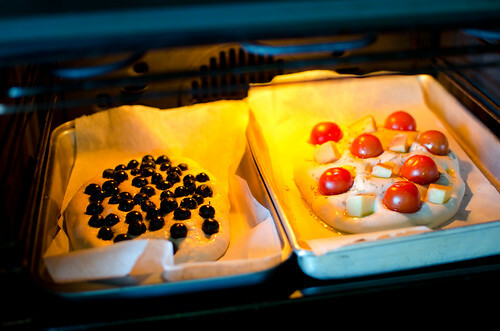 This way works air into the dough, giving you a light and fluffy texture. Test dough for ‘Gluten window’ by stretching a piece of dough between your fingers – if it stretches into a thin film without breaking, you’re good to go! If not, knead it for a few more minutes and test again. Now is when you add your toppings! 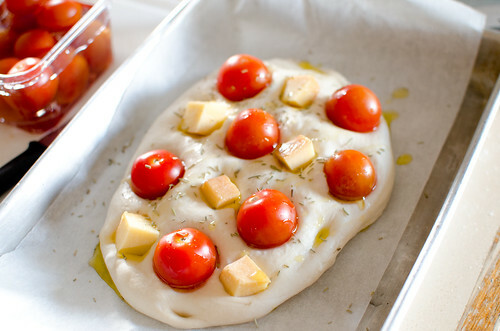 Dip your fingers in olive oil, and push the dough in, creating indentations. Push the toppings (cherries, grapes, tomatoes, cheese cubes, whatever!) into these indentations. Allow to cool slightly then enjoy! Your dough is gorgeously perfect! I couldn’t manage that smoothness in the class without the help of Matt… Looking forward to trying it at home though – cherry tomatoes are a great idea! Love the photos! I love making bread at home – it’s so satisfying. Thanks for posting up the recipe, I love how you can put pretty much anything on top of it! 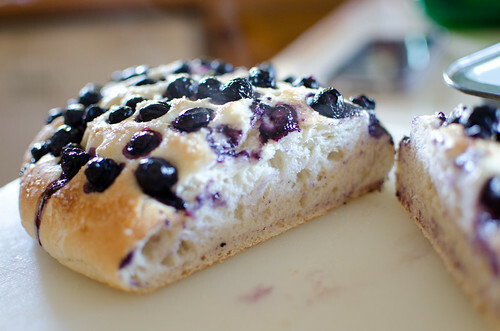 your grape bread looks divine. I’ve been baking quite a bit of sourdough lately too. I love the feeling of the dough in my hands. nothing beats homemade bread. love all your tips, i really want to do a bread making class! I was so impressed with the result! I have always used a classic technique making bread and was so surprised to see that this technique, which is quite different, works better! wow!!! didn’t know that fact about salt killing yeast!!! very interesting!!! your breads are so BEAUTIFUL!!! Yeah I had no idea until Matt told us!! No wonder breads have salt in them. Home baking is so much fun! 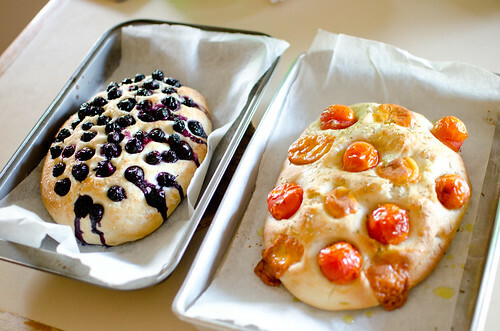 Both your schiacciata look perfect – yum! Is this the one you brought to the bloggers picnic? It was so good!! Thanks for sharing the recipe – I made a focaccia once at my mum’s farm with Concord grapes straight off the vine, rosemary and sea salt – will use this dough next time! Yes it is 🙂 Glad you liked it!! Wow that sounds amaaaazing. I love grapes + rosemary, great combination! It’s a little like foccacia isn’t it? I am all up for bread baking but always so so lazy. Hi! Would like to know. Can i leave the dough in fridge overnight? Bake the next morning. You can probably leave it for a few hours, but it’s probably best not to leave it overnight – it’s likely that your bread will over-prove and won’t rise in the oven! 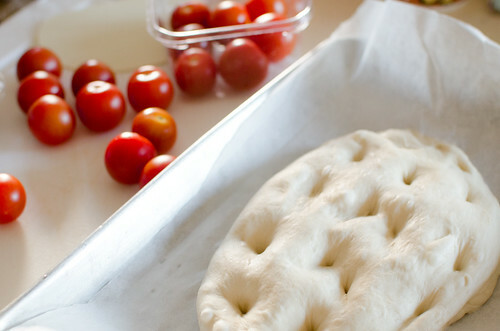 “[Recipe] Brasserie Bread�s Schiacciata con l�uva | crunchytiger”? It also has loads of very good information and facts.